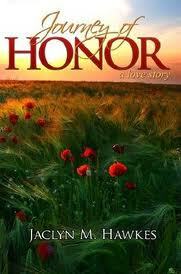 Journey of Honor: A Love Story is a tale of romance set in the old west during the mid-1800's. Trace Grayson and his adopted African American brother, Mose have decided that the bigotry in Georgia and the memories of the past are too much and decided to head out to find a more tolerable place to inhabit and they start their own teamster train to sell goods in the territories. After gathering all the necessary wagons to make a train, the pair set out from St. Joseph, Missouri to travel across the mountains to Zion, on their way to California. Giselle VanKomen, is a 17 year old Dutch girl who has found God through the Mormons and along with her grandparents, set out for Zion bringing with them the money that will help fund Bingham's Young's new church. However, before the train can begin its journey, trouble unfolds. Giselle is being stalked by an unsavory sort of man who wishes to have Giselle arrested, to ensure the train gets through the pass before the snow hits, Trace convinces all involved that the best solution is for him to marry Giselle and offer his protection across the trail. Being married to a beautiful girl takes all of Trace's convictions to remain strong and honourable. After many perilous encounters on their journey, they arrive at Zion and must make some of the toughest decisions in their lives. Does Trace continue on to California as was his original plan or does he love Giselle enough to forsake all he's known and join a religious movement that he has some serious convictions about. Trace is not impressed with the polygamy found within the church or their racial views on not allowing blacks into the priesthood. Will Giselle have the marriage annulled as soon as they reach Zion, which has always been the plan, or will she she remain where her heart wants her to be? I thought the book was okay, I had serious issues with the heroines age, and while I do know that the times were different, I am a bit prudish and felt that she could been a wee bit older, it was just hard reading the words from this young lady, knowing she is just that. I also found after a few chapters the struggle they have while lying in bed together to be redundant, and a tad tiresome. I was revolted over the whole polygamy issue and the thought of old men marrying young women to be a bit perverse and I was angry that a church exclaiming to have had direct contact with God would refuse anyone, especially as something as silly as skin colour. I did like the spots of humour dispersed throughout the pages and would've liked to have seen more of Mose, his wisdom was a breather in the book. Even though this book wasn't for me, if you like romance novels without too much violence or surprise, the ending is totally predictable, then you will enjoy this book. Disowned, she came to America anyway. Attacked and left pregnant by a vicious mob, she still pressed on. Finally in spite of being accused of theft by the vilest of her attackers, Giselle tries to remain as upbeat and uncomplaining as a prairie wildflower as she travels on to Zion. Thoroughly disillusioned with the ugliness and cruelty of slavery in the South. Trace Grayson leaves his young medical career to go west, hoping to leave bigotry and hatred behind. He begins taking goods by teamster train to sell in the territories. However, this fourth time across in July 1848, he's stuck in St. Joseph, Missouri, waiting for enough wagons to join the train so that they can leave. Knowing that if they don t start west soon, they ll be caught by snow in the mountains. Trace is thrilled when the final wagon signs on. Then, when the beautiful young Dutch girl traveling with the last wagon is falsely accused of stealing and is detained, the whole trip is jeopardized. Thrown together by circumstances, Trace and Giselle team up to begin to figure out just how to make this epic journey across a continent a success. This is a journey through the refiner's fire.